As I am about to complete several larger projects, I am looking for your help to line up new projects. Word of Mouth is the best advertising: a creative’s work is only as good as the happiness of the client. As professional photographer and creative, nothing fills me with more joy than seeing my clients using their new headshots announcing a new role, or their business portraits for telling the world about leading a successful project for their company. Do you have the eye for details? Corporate Portraits of Architect Paola di Romano. As a commercial portrait photographer in Genève / Geneva I do help my clients show them in their profession. Their line of work is their passion, just as much as mine is envisioning how to set their personal brand in a portrait session. When architect Paola di Romano from PdR Architects in Vésenaz asked me to create her headshot, I immediately envisioned her at work. When Nati Gomez and Mathieu Parreaux came to see me at my photo studio, in addition of creating solo headshots, we agreed on creating a portrait with both founders of Litigium on the same image. Since Litigium is all about common ground between two parties, inviting dialogue by letting go, I wanted to create a setting where both of them harmonise as much as they do in real life. Studies show that it takes less than a second for people to form an opinion on you! Are you trustworthy, friendly, reliable and professional? Or do you appear quite the opposite? See yourself with the eyes of a professional, who is the preferred partner of a dozen headhunters in Genève / Geneva. Comment below for a free critique of your LinkedIn profile photo. I am absolutely thrilled that Prodibi Pixel Magazine has been reaching out to me to showcase my work as Headshot specialist in Genève / Geneva ! In the interview I am talking how it all started and about my involvement as one of the handpicked associates of my mentor Peter Hurley and the Headshot Crew, the world's largest team of headshots photographers. The interview includes also some helpful tips for beginners in photography. And finally concludes with some hints at my next steps. Prodibi offers a tool for professional photographers to show my images at full resolution. When you click on each image, you will be able to see each picture at full resolution at 100% size. Detail of a Headshot by Patric Pop Photo in Genève / Geneva at 100%, screenshot aken on a 13" MacBook Pro. Learning from the best. Or how to shoot great portraits of regular people. Is he an actor? No. Is he a model? No. Answer: a regular guy shot by Patric Pop. Ever since I have been working as a professional photographer, I am putting my focus is on creating the very best images for all of my clients. 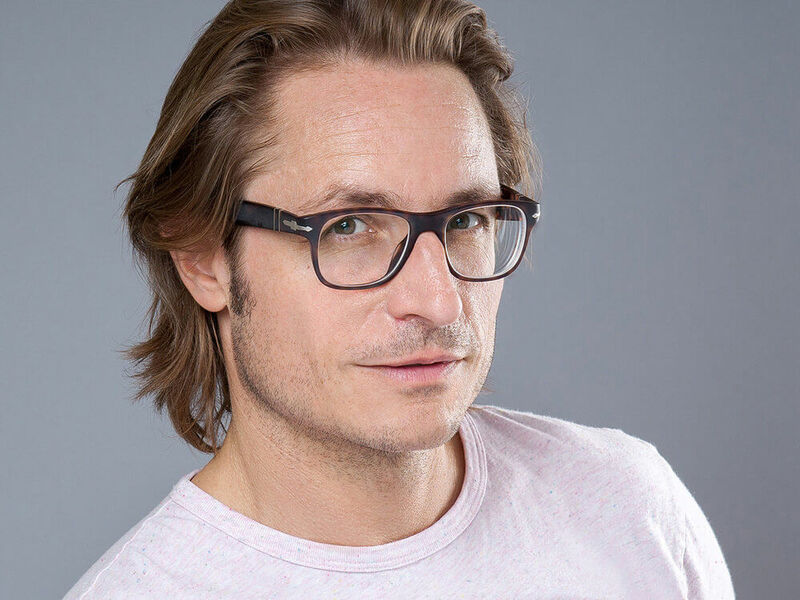 Originally, Yves was sent over by his CEO at HP to shoot some decent corporate headshots with me - I spare you the original image he had been using on his Linkedin profile – and out he walked with some absolute knockout images! That is also the reason why I do keep reinvesting a lot into continuous training to learn from the industry's leaders. I recently completed a training with Jerry Ghionis in Los Angeles. If you are not familiar with Jerry, all you need to know is him being the most awarded photographer ever of the WPPI (Wedding and Portrait Photographers International), earning him the title of Grand Master. Will I start now shooting weddings? I do enjoy working with people, but there is so much going on such a special day, not sure yet if that industry is for me. But working with Jerry Ghionis made me look at my work differently. While in the past I had been focusing on the light, I started to look more at where the shades define the portraits. This process lead me to deepen my portrait work and to bring in more depth into my headshots. Depending on the facial features of each of my clients I do choose the lighting style and background color that suits them most. Winning the Headshot of the Month competition. With my improved way of working, I did win the international Headshot of the Month competition in September, with the shot of Yves that you see here. In the final round of votes for winning the competition, my image did win by a 2/3 landslide against Emmy award winner Tommy Collier! Not only is this a greatly appreciated feedback, now I am invited to New York City to work for 3 days with my mentor Peter Hurley, the master of Headshot photography over the past years. He will also take my own headshot! The full « Shabang » as we Associates of the Headshot Crew say ! WHEN A SURFING YOGI AND A PHOTOGRAPHER MEET BRIEFLY. Prepare for the unexpected. Or how to get the most out of 15 minutes of a photoshoot. Originally from the raw climate of the Bretagne, Jerome is an avid surfer and long-time yoga teacher, and now in charge of Power Yoga East, the original donation yoga studio in Santa Monica. “ Meet me at tower 20 “ was the sole instruction I got over a hard to understand call on my cell phone. Where the heck is Tower 20 again? I found Jerome on his break between two classes, for a quick surf. Carpe Diem! In the spirit of seizing the day, we gave priority to the glassy, clean waves. We met in the lineup and enjoyed a couple of raw waves (with me getting my biggest wipe-out of the summer!). Now, he truly lives the life of a yogi and surfer, wearing no wristwatch in the water and using the sun to read the time. Back on the beach, it turned out we had 15 minutes left before he would need to leave for his next class at 11am. You can have the best plan worked out, only to throw it over and adapt to the new situation, namely when you are photographer! Instead of the nice vista point with some edgy rocks and whitewater splashing on shore, the new plan involved the parking spot and cars to all sides as the backdrop. Still dripping wet, and with the feet full of sand, I quickly did set up for the shoot. The good thing was that we wanted to include Jerome’s mystical Chevy Van into his portrait. 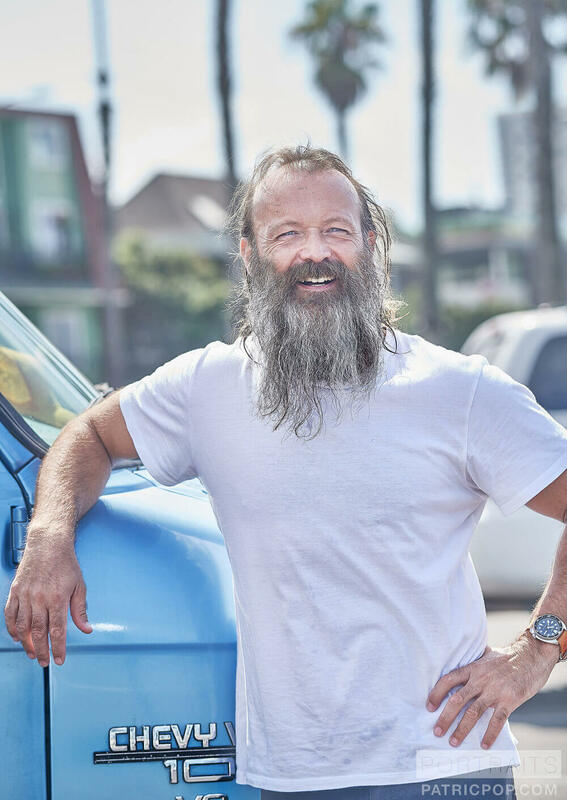 I wished we would have been able to explore all angles of the van and get Jerome into some really heroic poses and dramatic lighting with the van and one of his classic surfboards. However, the timing was super tight: all I had available was invested in coaching him to get into a proper pose I wanted to see him in. Yet, one of the cooler shots included Jerome chilling in his hammock, suspended above his old school surfboards. Again with little time on hand, improvisation is king and I quickly figured out an interesting set up of the light for a catchy visual. This short glimpse at his personal kingdom is part of personal branding, of reflecting one’s true nature seen through the photographer’s eyes. For my next visit, I am looking forward to do a proper “ Day in the Life ” photoshoot with Monsieur Jerome. Maybe this involves some rocks, waves and dramatic light. Maybe not. And if the latter is the case, it is okay too. I am already working on how to improve my own qualities as photographer to make any spot – be it as ordinary or ugly as you can imagine – a hell lot sexier to portray the true nature of the people in front of my lens. Reading the available light is most important. And so is experimentation. And in this case, lighting the van with only one speedlight was totally possible. As the van is cover with insulation foil, it created a very interesting light even with the sliding door closed. The choice of cropping is also essential in order to capture the moment. Finally, all details count. Whereas I would normally tidy up the location a bit, I just love the slight chaos, mainly the fact that Jerome showed up with two different flip-flops on his feet! As professional Headshot Photographer, I do keep preaching my clients the importance of updating their headshots on a regular base. Some might argue that this is a sales tactic to generate extra business. While they are not wrong that clients returning for a new photo session do make me happy – but then, I do offer them a repeat client discount on future sessions – the reason behind my statement reaches far deeper. The new updated me, reflecting my personal branding. My old Headshot as used on my business card. Time to change the cards! It has been scientifically proven that a good headshot portrait increases the recognition value of any candidate or prospect business partner. In short, having a headshot that represents you does help the other party identify you more easily. A prospective employer will be reassured that the candidate tells the truth, even if only when the headshot matches the real person. Can you believe how an up to date headshot builds trust and has any first conversation starting with the right energy? Over the past year I did experience it at numerous occasions that my own clients did expect someone else! When they looked up my website, they saw a creative, with longer hair and shaven. However, some time ago, I decided to get my hair cut quite short, and to grow a hint of a beard. You could say, going from semi-hippie to modern day hipster. Truth is that it is super hard to get, what I call a “high-end selfie”, a decent self-portrait. There is no one to direct you, who guides you in minimal increments of millimeters. Sometimes, I wished I could clone myself for art-directing my alter ego! Now, that I just took the time to redo my own headshot, I do feel better. Much better. My personal brand lines up again with my persona. It is a true confidence builder. And I am also confident that the future prospects who inquire for their headshots taken, book the guy who is in charge of crafting good stuff for himself. Looking forward to hearing your thought on this subject. The Geneva Associate of Peter Hurley's global Headshot Crew. Discovering the Think Tank Production Manager 50, my professional gear for all of my on-location photoshoots. I am by no means a gear head. Whereas some folks spend a dinner party convincing other guests that their gear is the best – and, annoyingly like to camp on their position – mainly if they are Canon, Nikon, Sony or Pentax shooters, I usually step away from such discussions. To me the gear that I use at this moment, is the best I can imagine for the job and I know how to handle it for the best quality results wanted. When I was studying at Art Center College of Design, first in La Tour-de-Peilz, then Los Angeles, California, my photo teachers kept preaching to look for cost effective alternatives to expensive gear. And in all the years art directing other professional photographers I have seen the multitude of techniques, accessories and approaches leading to fabulous results. Whenever I have been leaving my humble photostudio near Rive and the Rue du Rhône in Genève / Geneva, to travel to a corporate photoshoot, I always felt like a fraud not owning professional gear to stash away all my precious equipment. You know, the lights, strobes, softboxes, lighstands, cables, extensions, reflectors and deflectors, and finally the camera body and lenses. I had been considering getting a hardcase wheeled golfbag to travel to the locations. But then again that solution did feel too much of «bricolage», a do-it-yourself approach. Come in the day that my path crossed the latest product of ThinkTank, the Production Manager 50. And I fell in love. This is one beast of a trunk. The quality looks and feels great. And I am blown away by the number of functional details that make this trunk probably my most important addition to my gear. Now, with the Thinktank bag, I hop on the tram at Rive or the bus at Rue du Rhône and arrive with one single piece holding all my professional equipment. Setting up on location is a piece of cake, as everything is neatly stashed and organized to my likings. And boy, everyone is just so impressed. It says professional photographer to the connaisseurs and turns heads as I could wheel a corpse around. The only downside I have noted in using it for the past year, is the weight. It aloneweighs over 10 kilos. And it is a sheer pleasure to carry it down and up again on a flight of stairs! That is why I practice my yoga at INNERCITYOGA, to keep my core strong and my back healthy! Indeed, an indestructible true workhorse for professionals shooting portraits and headshots for companies and international organisations.